Our distributed architecture is built in a flat topology in which all Brains are hierarchically equal. Unlike legacy architectures, in which a single master control processor controls several slave units, our Brains are stand-alone. Data is communicated between Brains automatically, eliminating the need to program a dedicated path. Control processors (Brains) control and manage the space. Brains run on a standard IP infrastructure, eliminating the need for proprietary cabling. In addition, physical hardware Brains feature a universal I/O gateway that allows connection of any non-IP device using legacy interfaces, e.g. RS-232, IR, GPI/O, etc. Software-only Brains are available on Kramer Touch Panels, VIA Connect PLUS devices, and dedicated hardware platforms for running up to 50 Brain instances (multiple rooms on a single machine). Upon installation, all brains can automatically discover each other and are immediately aware of the connections between all the devices in each space. The best part is that the brains communicate independently to share information and resources. Kramer's non-hierarchical, distributed architecture of stand-alone Brains ensures that system operations will remain up and running in case of a failure in any unit. 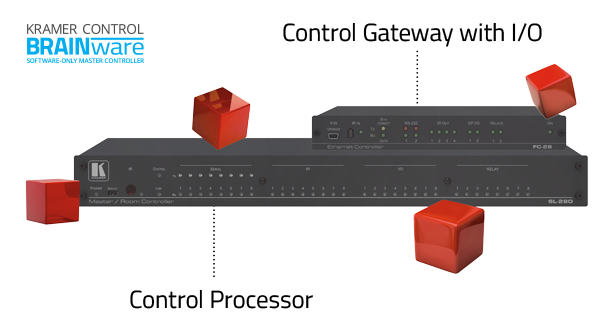 Kramer Control leverages existing IP network infrastructure, allowing you to scale up at will without needing to deploy a parallel network or to invest in new equipment, such as switches and routers. With Kramer Control the days of tedious updates and device software upgrades are over. 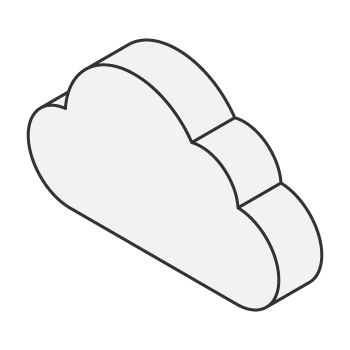 All Kramer components are automatically and seamlessly updated from the cloud. Kramer’s cloud architecture frees you from the rigidness of on-premise programming. Set up your control system from anywhere in the world without the need to be physically onsite. Start, stop and resume later from somewhere else, making control setup and configuration a borderless experience.